Weaning describes the process in which puppies are gradually introduced to other foods than their mother’s milk. Weaning is inevitable and normal. It happens in the wild, naturally, when the puppy grows and it happens with pets as well. If you have newborn puppies, you might want to consider giving their mother a hand with the weaning. There are no strict rules to follow for weaning puppies, but there some tips worth considering. Sasha and her baby Rufus When is the right time for Weaning Puppies? The first two weeks of a newborn puppy are spent mostly sleeping and enjoying his mother’s milk. 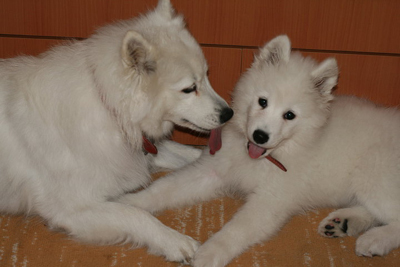 Puppies have weak senses in this period and need their mother’s help to survive. They have to be warm and fed. In their third week, senses open up. They become active and able to respond to external incentives. However, you may not begin the weaning process. They are not ready yet. The right time for weaning puppies is on their fourth week, when they become interested in the environment and in other foods than their mother’s milk. They get a bit strong and coordinated and they start growing teeth. If the mother has been on commercial puppy food for the pregnancy period, you can start by feeding your puppies the same brand, just to make things easier for them. Mix the food with puppy milk replacer and hot water and then blend everything. In my opinion, weaning puppies involves a bit of tricking like the more first meals resemble the mother’s milk, the better. Let it be warm and moist. Also, separate the puppies from their mother while feeding and let them enjoy the food for 20-25 minutes. Choose a large dish so they can all have easy access. It might turn messy and that’s why I suggest feeding them in an easy-to-clean spot. Don’t worry about the food on their paws after they finish and allow the mother to clean the pups and finish the food. The process of weaning puppies should last around 3-4 weeks, until they are 7, 8 weeks older and their stomachs are ready for kibble. Reduce the quantity of water gradually and don’t hurry the weaning process, as switching to solid food too soon might be harmful for the puppies’ stomachs. Feeding your puppy correctly is the first step towards housetraining and crate training. Creating a feeding schedule is highly recommended. Young puppies have high metabolism and they require frequent meals. Until the puppies reach 4 to 6 months, they should have 4 meals a day. Also, you should avoid feeding them table scraps or too many treats. Be consistent and stick to the same brand of dog food. Ooh!…about the brand…just try to choose a premium brand based on meat protein and not on grains. The food has to satisfy the growing needs of puppies and to contain all the needed nutrients. Moreover, puppies cannot tolerate grains and you may end up giving them allergies. Puppies need a lot of water so be sure you offer them a constant, fresh, supply. Give them water together with the food and after playing, napping or chewing. Restrict the water after 8 p.m. if you don’t want to have housebreaking problems. Feeding your dog organic, fresh food and not kibble might appear a little bit time-consuming and more expensive, but it’s not. Commercial dog food is far from healthy and its results are related to visiting your vet too often, allergies and digestive problems. If you feed your dogs raw food, you probably know all this. Weaning puppies to a raw dog food diet is quite simple. You can start by preparing milk meals, using raw, fresh goat’s milk (or cow’s). You can add some other fresh ingredients like eggs, honey, flaxseed oil or yogurt. Blend all the ingredients and serve them to your puppies. When the puppies are 6 weeks old you can start them on solid food, ideally a vegetable mush with 50% protein content, without giving up on the milk meals. Mixing the foods very well helps the puppies get all the nutrients that they need. Serve one kind of vegetable or meat before moving to another one. It’s the best way to identify potential food allergies. When you’re sure that your puppies are not allergic to any kind of meat or vegetable, you can mix them. The best meats you can use are animal offal or organs. Avoid grains and also vegetables like cabbage or broccoli, as they can cause gas or thyroid problems. And always provide your puppy with fresh water!